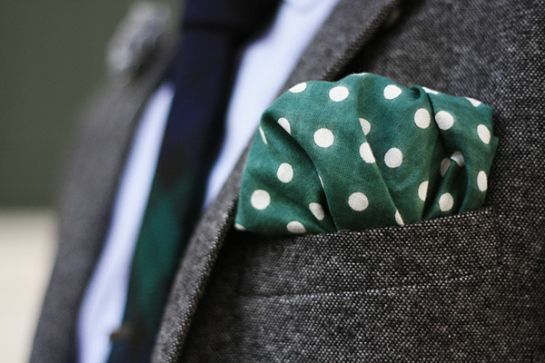 Polka Dot pocket squares are well and truly back with a bang gentlemen. They’re slick, sophisticated and dare I say it, cute, which is why more men than ever before are combining them with their favorite outfits and jackets, to give their style an instant twist. Justin Timberlake recently showed off a black pocket square with white polka dots, combining it with a smart dinner jacket, to prove that polka dots aren’t just for casual wear. Likewise, Daniel Craig showed up to a red carpet event in London this summer with the reverse style polka dot pocket square, worn with an exquisite black dinner jacket and matching bow tie, proving further that the polka square is truly A-List. If you’re looking for a little inspiration from Hollywood’s red carpet royalty, to master the perfect outfit, have a sneaky peak through some of our below suggestions from the Fox and Luther range and do so gents, with the perfect polka face! Starting off simple, outfit number one comes with the help of Fox and Luther’s Dotted Black Pocket Square. Similarly to Mr. Timberlake’s iconic look, combine this pocket square with a black dinner jacket and fresh white shirt, to add a touch of style to an otherwise standardly formal look. To make things a little more casual, unbutton the top button of your shirt and prepare to dance the night away. If, however, you do need to keep things formal, why not combine this pocket square with a black bow tie, like Daniel Craig and give your outfit serious sophistication? Next, we’re looking at one of our most popular pocket squares, Fox and Luther’s Royal Blue Pocket Square. What’s great about this square is that, it’s stand out royal blue tone is perfect for matching other men’s accessories, such as your tie, hat or even watch strap. This polka dot pocket square is best worn with light grey or even white jacket’s, with the royal blue colour flow throughout your accessories really standing out. The polka dot aspect and white boarder just ads to this square’s endless charm and when combining it with a royal blue tie, it really does look the part. Red polka dot pocket squares always seem to go nicely with one colour in particularly, royal blue! There’s something about the way these two complement each other in a casual look that just boosts style greatness. Combine Fox and Luther’s Red Dotted Jacket Square with a royal blue open jacket and you’ll be onto a sure fire winner gentlemen. Worn with a softer blue shirt underneath with a couple of buttons undone, along with some grey slim fit chinos and bang! The ladies simply won’t know where to look. Fox and Luther’s Polka Heist Pocket Squarereally does break all the boundaries of business wear. Picture a navy blue suit, slightly off white shirt and a navy blue tie. Can’t help but think something is missing? Nonchalantly puff this lilac pocket square into your jacket pocket and onlookers will be quickly running out of superlatives to describe your brand new and upgraded look. At the forefront of men’s fashion are Fox and Luther and with such a simple style accessory like this, you really will stand out from the crowd.